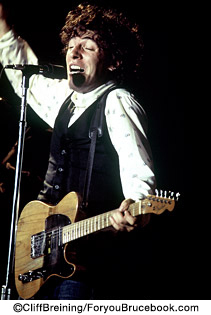 Danny has accompanied Bruce Springsteen since	1969, in the bands Child and Steel Mill. He's worn his hair long,	sported a beard and adopted a lean trim look during The Rising	Tour. Quiet by nature, his playing speaks volumes and contains	multitudes: He brings more to a Springsteen concert than he's ever	been given credit for. In Danny's case greatness is understood,	measured in the sublime flicker of his organ-playing hands. Always	remembered, greatly missed. 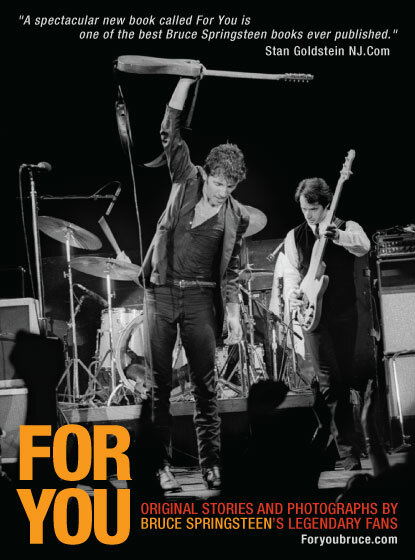 For You is packed full of recollections from the legendary fans of Bruce Springsteen and his famed E Street Band, as well as most of the other bands with which he has worked. Read tales about Bruce in Steel Mill right up to the latest Bruce and the Sessions Band in the Live from Dublin concert at The Point, Ireland in 2006. This marvelous collection of fan tales, testimonials and memories alsofeatures many photographs of other musicians and personalities who mademusic with Bruce over the years: The E Street Band, Southside Johnny,Bono/U2, Sting, Jon Bon Jovi, Patti Smith, Robert Gordon, Gary U.S. Bonds,Joe Grushecky, Ronnie Spector, John Fogerty, Neil Young, Michael Stipe,Jackson Browne, and many more. This compilation of never-before-publishedfan memories is, quite simply, fan-tastic. Make sure you put your name on one of them now. "I received the book, and well...I was really blown away by the whole thing.If any book can capture what it's like to be at a Springsteen show, this is it.The images are as good as concert photos get." 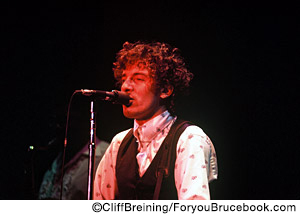 As a Bruce Springsteen fan, you already know of "For You," the song, as well as the previous incarnation of Foryoubruce.com. What the previous site only promised we are now set to deliver. This book is a brand new item for you to consider adding to your collection of Bruce Springsteen memorabilia. But you'll need to move fast as it is being printed as a limited run of only 2000 copies. For You - the book is finally a reality thanks to you - the fans. This unusual storybook comes with lots of original photos - almost 500 in total. But it is far more than just a Bruce Springsteen picture book or a photo album. It can also be considered to be a sort of a biography - as told through a collection of first-person short stories. For You is not an unauthorized biography of Bruce Springsteen, even though he is a part of all the stories. These are also not the tales of the personal experiences of this fabled rock star, whose career spans almost four decades. These tales focus on the experiences of his legions of fans - aka the Bruce Tramps - as they follow him around from concert to concert, tour to tour, and year to year. 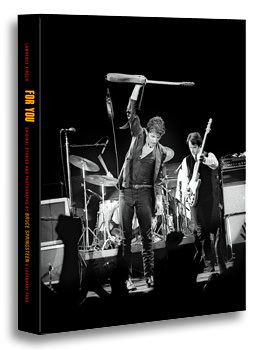 For You - the book puts the fans front and centre, focussing on the personal stories of a little-documented but essential segment of the world of popular music - the fans. And in this case, the legendary Bruce Springsteen fans. Those who were there from Born to Run along Thunder Road, through The Darkness on the Edge of Town and The Main Point, hurtling through the Backstreets via the Roxy and the Hammersmith Odeon, and San Francisco's Winterland, following the Ghost of Tom Joad and Devils and Dust, back to New York's famed Madison Square Garden and London's Royal Albert Hall… then right back up the road to Frankfurt's Festhalle, Stockholm's Hovet Arena and Oslo's Spektrum as well as Milan's famed Forum. All the way, it seems, up the steps of Carnegie Hall, with a pit stop or two at the Stone Pony along the way. For You documents the life and times of the fans of one of popular music's true icons of rock and roll - The Boss himself. 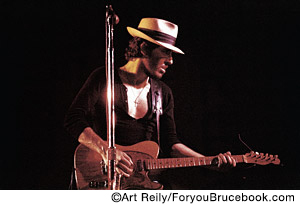 From the very beginning of his career out on the New Jersey shore as a leather-jacketed college dropout, through the eyes of his fanatic and faithful fans, we follow Bruce; rocking with him around the world to Berlin, Brussels, Bologna, Barcelona, Brisbane and back again to Boston, Bridgeport and Buffalo. Each decade brings new music, new places to visit, new and old fans to delight, and new memories to make. The fans and their stories chronicle Springsteen's early development in the music scene of the 1960s and 1970s, and through all of his amazing successes, including his presentation by Bono and induction into the Rock and Roll Hall of Fame on March 15, 1999, and following him right up to his All-Star Tribute Concert in mid-2007. In fact, what makes this book unique is its absolute fan-focus perspective. 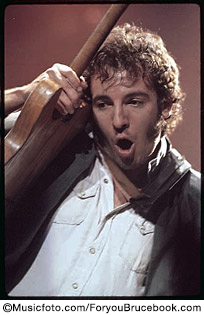 It is, of course, still very much the public face of Bruce Springsteen's career: Springsteen live, lyrics, songs, new albums, classic albums, photos, concerts, tours, the E Street Band, Bruce Springsteen and The Sessions Band. You name it, it's in here! "The Wild, the Innocent & the E Street Shuffle"
For You - the book also contains many previously undocumented interactions behind the scenes, off the stage as well as on it; all of which are told through the personal experiences and photographic lens of his faithful fans. "The book is a true gift to a great artist. The stories are loving, sensitive, funny and a delight to read and the photos are spectacular. …it has created a lasting memory for all Bruce fans and one on a personal basis I will always treasure to have been a small part of the memories." For You also contains an incredible array of previously unpublished and original photographs, both in glorious colour and mood-setting black and white. More photos than in any other Springsteen photo book. 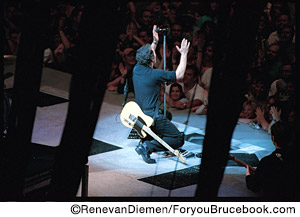 For a sneak preview of what a truly amazing picture book this is, take a tour of the Springsteen Photo Gallery. "Tramps like us, baby, we were born to run"